Remote Deployment Software. 7 must-have requirements. Home / IT Management / Remote Deployment Software. 7 must-have requirements. What are you currently using as your remote deployment software and patch management tool on Windows computers? If your looking to speed up and reduce the workload when updating to hundreds or thousands of Windows System, your going to be listing your own requirements on what any third party vendor tool needs to meet. To help, here are seven deployment and remote management features of RemoteExec that you don’t want to be without. 1. A proper reporting mechanism to rely on. Monitor the progress & see the result of the execution. 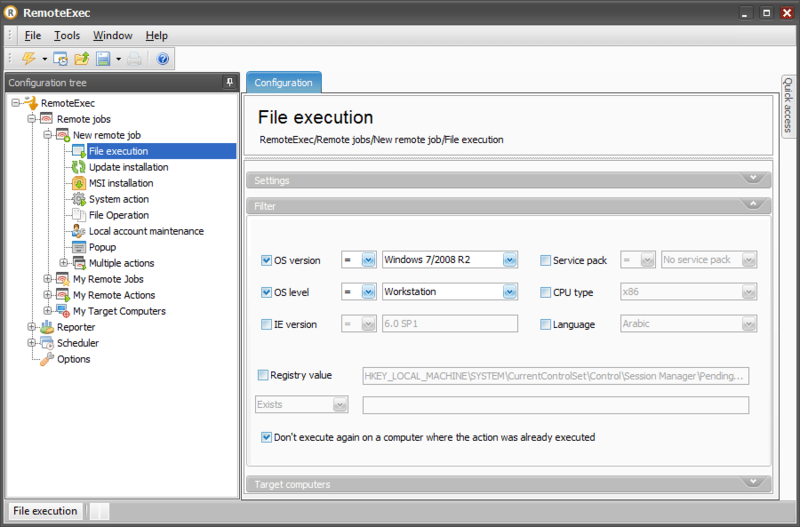 RemoteExec comprehensively logs all remote executions (and their results) it performs and automatically generates graphical, printable reports. It provides success or failure reporting for any job it executes. 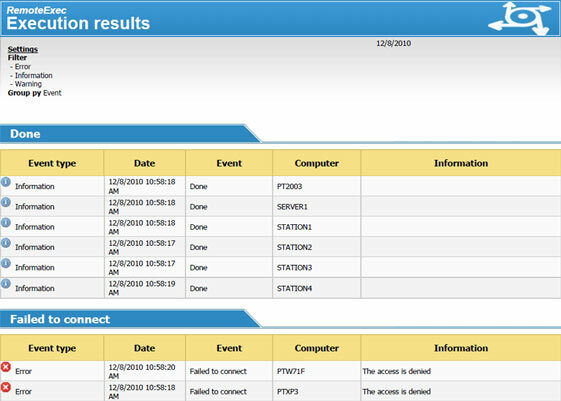 RemoteExec also collects and displays the return codes generated by the remote processes, allowing the administrator to check system status. For example, you can deploy MSI packages on your whole Windows network, in a couple of clicks, and be instantaneously informed of the results. What is the average success rate when you deploy a package/application on all your computers? How much time do you spend fixing installation failures? Once an execution is finished, RemoteExec automatically generates a list of systems on which the execution failed (if any). That list can be directly reinserted to rerun the execution and complete the task – greatly reducing IT workload. 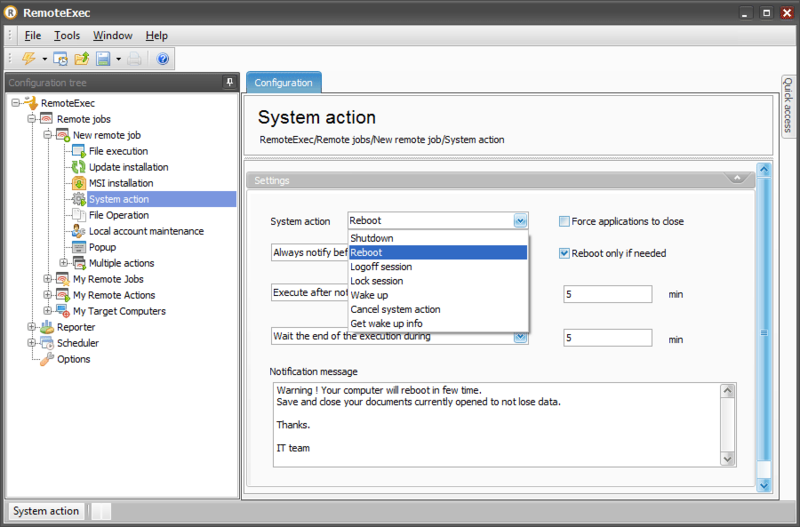 RemoteExec supports multiple action jobs to let the administrator group actions together into a single task. Using this feature, you could use Wake on LAN to turn a target PC on, an MSI task to install an application, and a shutdown task to turn off the target PC when finished. 4. 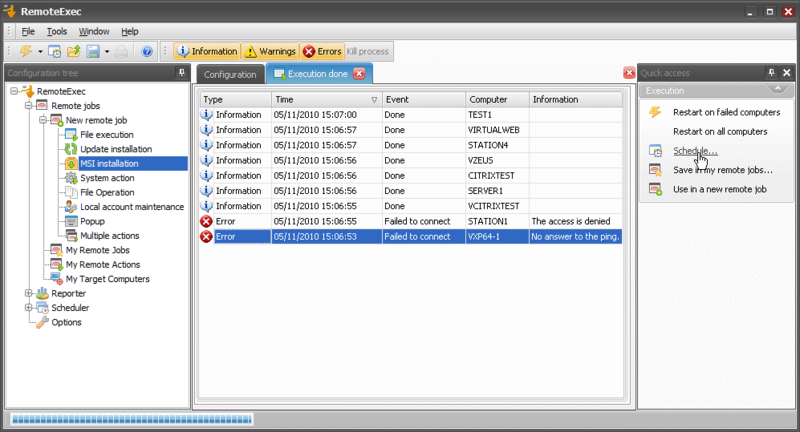 Wake on LAN: Remote Administration – even when the PC is turned off. RemoteExec supports Wake on LAN, which allows you to access a PC even if someone inadvertently turned it off, perform the updates/installations needed, and if needed, turn the PC off again. This allows true remote administration, not just remote administration as long as the PC is turned on. RemoteExec has a built in scanner which collects remotely the Information on a Systems configuration to make it possible to then execute a deployment only on certain types of workstations or OS (etc) without having to select them manually. Eliminate all disruptive interventions during working hours. Schedule deployments to workstations outside of working hours or to automatically rerun previously failed actions due to system unavailability. An intuitive, user-friendly GUI with predefined action types, it’s simple and quick to configure and launch different executions. RemoteExec can be used to silently perform remote executions in the background, or can launch interactive executions displaying information to the user and requiring their interaction. 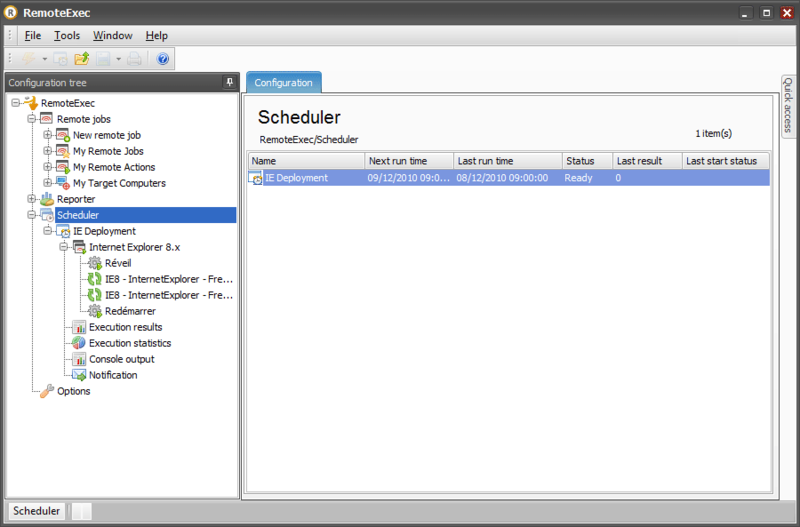 RemoteExec is an agentless, encrypted solution that is fast, easy to install, simple to use and totally non-intrusive. It offers a centralized single point for controlling, managing and reporting on all remote deployment and execution. Download your Free Trial for RemoteExec now.